Written by Lauren Forse on Oct. 4, 2013 . Gauteng is the smallest province in South Africa with only 1.5% of the land area and is located in the heart of the Highveld. Small but mighty, Gauteng is considered the economic hub of South Africa, making up a third of South Africa’s GDP. It is home to Johannesburg and Pretoria; two highly urbanised cities that are a must visit for both tourists and South African locals alike! Here are some of our top picks for what to do in Gauteng. Not quite in Gauteng, Mmpumalanga Escarpment is close enough to Gauteng to pop for a quick visit. With so much hustle and bustle, it’s nice to escape out to the county and take in some fresh air and stunning sights. The Mpumalanga Escarpment is popular with tourists, not because of the gift shops but because there is so much you can do in just one weekend. Sabie is the first stop and we really love the abundance of waterfalls along the Sabie River such as: Sabie Falls, Horseshoe Falls and Lone Creek Falls. Our favourite is Lone Creek Falls which is 68m in height and surrounded by tranquil scenery with a footpath to the top of the falls. If waterfalls are your thing then 13km from Sabie you will find Mac-Mac falls; named after the Scots who tried to mine there for gold in the 1870’s. With two streams that plummet deep into the gorge from 56m up it’s a shame that the best viewpoint is from a steel cage on the edge of the gorge. If you’re bored by waterfalls at this point then head along the Panorama Route and discover Wonder View, the highest viewpoint along the road R534, amongst other unparalleled attractions. With only a small parking area and lack of facilities it feel amazing to just stand there, look out and forget everything. You will feel like a king of the sky with views stretching further than the eye can see. Then, carry along the Panorama route, heading towards the third largest canyon in the world: Blyde River Canyon. Boasting waterfalls, viewpoints, history and hiking trails Bylde River Canyon is not one to be missed. If you are stuck for time then we at least recommend looking out from The Three Rondavels/Sisters, a fantastic viewpoint that captures the canyon in a glance, and visiting Bourkes Luck Potholes – they’re not only fascinating but have interesting historical value. If you want to relax, but away from the restaurants and shops then take a trip to one of the many botanical gardens in Gauteng; our favourite has to be the Johannesburg Botanical Garden. Established in 1964, it was originally just rose gardens but over time expanded to cover the 125 hectares they do now. Across the 125 hectares you become lost amongst the vast variety. With a rose garden filled by 10,000 roses and the Emmarentia Dam sharing the acreage you will easily spend a day here. Finally, as your trip as coming to a close a gentle wander through Pretoria, known as the City of Roses, will sum up your trip to this outstanding province. With the perfect blend of beauty, architecture and history Pretoria, for me, embodies its home province as the smallest but mightiest in South Africa. 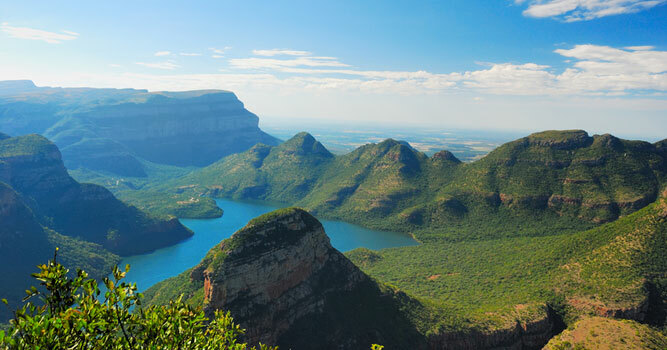 These are just a few areas to visit in the Gauteng province, but if you have anything more to add - why not connect with us on Facebook or Twitter?